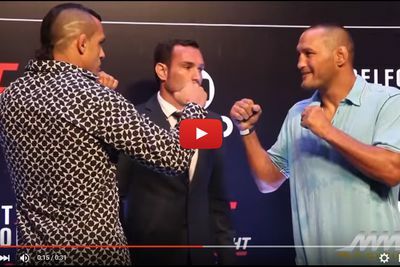 Legendary mixed martial arts (MMA) slugger Dan Henderson didn’t want to fight Vitor Belfort in Brazil, but it appears the offer was a “Phenom” rubber match in Sao Paulo — or not at all. The fact that we’re just over 48 hours away from their third dance, I’d say the opportunity to avenge his loss to the Brazilian at UFC Fight Night 32 was too hard to resist, and alas, these two aging warriors will throw hands for the final time (we hope). The action takes place in the UFC Fight Night 77 main event on FOX Sports 1, scheduled for Saturday night (Nov. 7, 2015) inside Ibirapuera Gymnasium in Sao Paulo, Brazil. To get fight fans amped for this weekend’s throwdown, both Henderson and Belfort took part in a special UFC media day to promote their fight. Watch them face off in the video above.